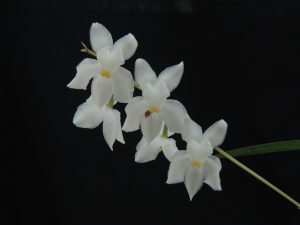 This exquisite and sweetly scented species species from Mexico and Central America is a cool growing species found in high altitude cool mossy forests from 1200 to 2600m and so we grow plants in our Cool Americas section, shaded and watered throughout the year. The scent is reminiscent of almonds and is very popular amongst the noses of Orchid Project students. The flowers are long lasting is they are not water damaged which is unusual for such a scented flower and a plant which is diverting valuable resources to producing fragrance oils. The flower stems are thin and flattened, and over time they become attractively arching and we avoid the widespread habit of fighting the graceful habit by enforcing vertical spikes with canes and ties. 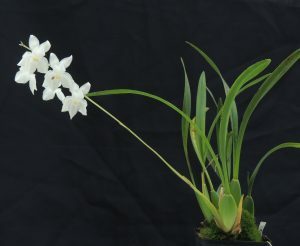 The name Cuitlauziana pulchella reflects recent molecular studies into the Oncidium family and this species started life in the Orchid Project as Odontoglossum pulchellum and then Osmoglossum pulchellum before taking on its current name. Either way, ‘pulchellus’ is latin for ‘pretty’ which is a great choice for this pretty little orchid.